With over 45 years of experience in the travel industry, Kay is co-Founder of Royal Travel & Tours, and has traveled to all corners of the world. As a Spanish major in college, she lived and studied in Mexico and then worked in Buenos Aires, Argentina. Thus began her love of travel. 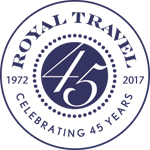 Kay most enjoys researching and booking independent travel for groups or individuals throughout Europe, South America and Australia/New Zealand. Riding camels around the pyramids in Egypt with just my husband and a guide. Hard to imagine the magnitude of the pyramids and the Sphinx without being there. Love London and all of the UK for its history, pomp and circumstance, castles and lovely countryside. I was a Spanish major with a minor in Latin American Studies in college and lived with a Mexican family and went to school in Guadalajara, Mexico one summer. I worked in Buenos Aires, Argentina the next summer. These experiences made me want to visit more of the world.